A couple of weekends ago, our nephew, Luke, asked if he could spend the night at our house. Since we normally seem to have more than our own children around for sleepovers, this was no big deal. It’s cool that the kids want to sleep over at our house, even if it is extraordinarily annoying when there are groups of girls giggling late into the night. One of the things that Luke wanted to do while staying at the house was play euchre with us. He had never really played, so I guess it was up to us to teach him. Wendy decided that maybe all the kids could learn how to play. While I was out in the garage on Sunday afternoon, she set them up at the dining room table with a deck of cards sorted out into a euchre deck. When I came in the house after finishing my work, Wendy had each kid set up with a hand of cards, lying face up on the table. She was explaining each move as it went around the table, giving the kids an idea of how the game worked. I leaned over to watch how the kids played it. They still needed more instruction, but they were well on their way to learning the game. With the holidays coming up, this will prove to be fruitful as we all like to play cards. We can be assured that there will be enough for a table with new suckers...I mean players. All this made me think back to when I was learning to play euchre. I had seen my parents and grandmother playing, and I wanted to play, too. After giving me a five minute, rudimentary tutorial, I got thrown into the fray. And my grandmother, a cutthroat when it came to cards, gave me no parlay. I lost, and I lost badly. However, once I started to win, I could hold my own very well. 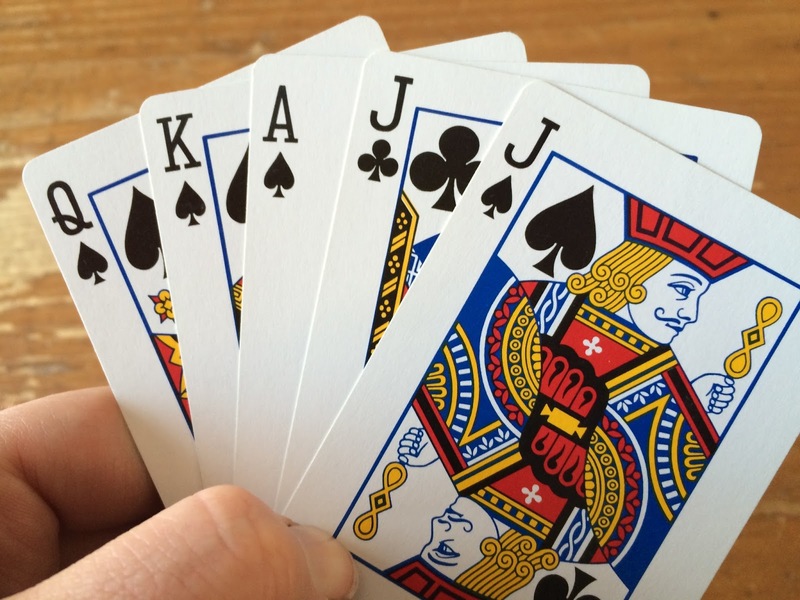 Euchre was a big deal growing up. Most of my friends played it too, and it was a daily sport at the lunch table throughout high school. During my senior year, I had two lunches in a row. My friend, Matt had that same lunch schedule. We’d start one game during the first lunch period, and continue with a second game with new partners during our second lunch. This happened all the time. Cards have always been a big part of my family growing up. Both my brother and sister play cards. I’m not sure how regularly anymore, but it seems like jumping on a bike and riding even after a long hiatus. We played lots of cards. Rummy. Cribbage. Poker. Gin. Solitaire. Kings in the Corner. We wore out cards kind of regularly at my grandmother’s house. When the cards were worn out, they weren’t simply discarded. They became toys for the grandchildren. We would keep them all in a doll’s suitcase, which became a bank. The cards were cash with face value denominations. And then we’d play “Life.” We even had an old ledger so we could keep track of the money we had for the next time we played at grandma’s house. Cards still are a very big part of our family. Each year, we end up with each of us getting a deck in our stockings. I have an account at Bicycle so I can get cards to hand out as gifts. I know it seems weird, but who doesn’t need another deck of cards? There’s always a use for them. They’re always a great addition to your winter emergency kit. Those cell phones won’t last forever. And what better way to get to know someone than play a game of cards with them while you’re stranded in a shady diner this side of the North Pole? Craig Bacon has a brand new deck of cards ready for Christmas gaming.